books art blog bio visits calendar media freebies etc. Here we go! 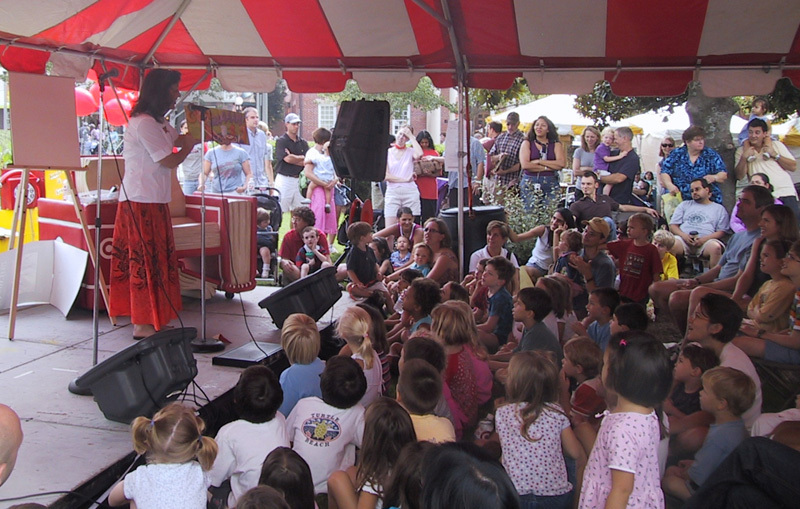 Today kicks off the first annual Decatur Book Festival! My favorite independent book store, Little Shop of Stories, tied in with the Atlanta Journal and Constitution and the Georgia Center for the Book to pull together an amazing cast of authors and illustrators. It's a free event starting tonight with keynote speaker, Arianna Huffington. Saturday brings lots of fun activities for kids, starting off with a parade led by the Cat in the Hat. I'll be speaking on two panels. The first at 11:30 am is called "Cheese and Peas" - Cheese for my book "Glitter Girl and the Crazy Cheese" and Peas for Danny Schnitzlein's book "The Monster Who Ate My Peas." The second will be at 4:30, a panel of illustrators including last year's Caldecott winner, Chris Raschka! I am honored to say the least. Sunday I'll be giving a drawing demonstration at Little Shop of Stories and Carmen Deedy and Alan Gratz will have the stage. The entire event finishes off with the fireworks that were rained out on July 4th. It's going to be amazing, and free! So don't miss it! I'll post my experiences here, so check back to get the play by play! Lunch with Chris Raschka, two time Caldecott winner! What a nice guy! 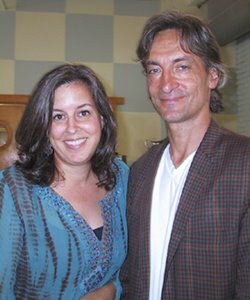 Chris Raschka has been writing and illustrating picture books for sixteen years and has experienced every kind of success there is to be had in this industry. I talked to him about his history, his life as an illustrator in New York, his experiences with the different publishing houses, and the stories he shared about the good company he keeps from his years in the biz. He was very thoughtful and kind, a true gentleman. He struck me as very European looking, or is that because he's from New York? Either way his look seems to fit his art, which to me has a European feel with its graphic shapes and sense of high design. I find his work both whimsical and cutting edge. It's hard to believe I will be on a panel with him tomorrow, I am humbled but excited. This is the cover of his Caldecott winner, "The Hello, Goodbye Window." Okay, this one's going to take a bit to recall properly and pull together. I had a great time, but I'm exhausted too! In the mean time, there was a great article in Sunday's AJC (Atlanta Journal and Constitution) by Staff writer Jennifer Brett (who interviewed me behind the stage): ARTICLE. Ohmigosh. Okay, let's see if I can relay the whirlwind of Saturday. What a spectacular day! I am sorry we missed the parade. Supposedly all the children were in it . . . with kazoos! We arrived in time to see Chris Raschka's presentation. He read several of his books and drew his two cats - which the kids just roared with laughter over. Then it was Danny's and my turn. Danny sang a song and read his wonderful book, "The Monster Who Ate My Peas." It's one of my favorites to read to kids too. I read "Glitter Girl and the Crazy Cheese" and did a drawing demonstration (click the images to get a closer look). The crowd was huge, and I have to admit I was a bit nervous, although it might have been the microphone. It's so strange to hear yourself . . . amplified! Gads, the kids were fantastic. They screamed so well and I never get tired of seeing all those smiling faces. It was so fun! Afterwards we signed books, gotta luv it. 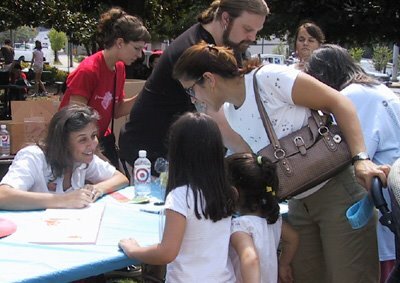 Several friends dropped by for the event including illustrator buddy Liz Conrad and newly published author/illustrator Ami Blackford. Next, I was interviewed by Georgia Public Broadcasting (GPTV) for an educational video they're creating. They fussed over me to get the microphone right - bizarre! Never done THAT before! The interviewer sat to the side of the camera and asked questions, this is during the interview. In between events we hung out at LENZ, a marketing firm downtown (they created the fabulous event poster) who set up a VIP rest area in their offices for the authors. Thank you Lenz! Back to the children's stage we watched Deborah Wiles talk about her books, including the award winning "Each Little Bird That Sings" and "Love Ruby Lavender." 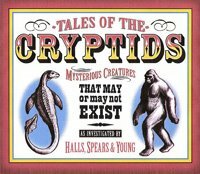 Then we stayed to hear my friend Kelly Milner Halls talk about "Tales of the Cryptids" with the illustrator Rick Spears. Kelly has such a great voice and weird sensibility, she was a joy to listen to! And it didn't stop there folks! At 4:30 I was on an illustrator panel with Chris Raschka, Mike Lester, and Michael Montgomery! Just before we went on, I had the pleasure of meeting yet another great in our business, Bill Mayer. Turns out he lives just around the corner and will be illustrating Danny Schnitzlein's new book, "The Monster Who Did My Math." After a quick rush home for showers and a sandwich, we headed back to the courthouse for a VIP party where we hung out with our bud, Karin Slaughter and met Natalie Dupree. (Stan told her she taught him it was okay to be messy in the kitchen!) We also hung out with some of the amazing organizers of the Decatur Book Festival, Daren Wang, Bill Starr, Alice Murray (of the AJC), Tom Bell (freelance writer), and Joe Davich (Georgia Center for the Book), and of course, Diane Capriola of Little Shop of Stories. Wow. So it was amazing, and I do mean AMAZING!! 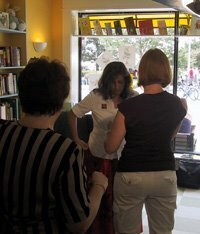 It was a huge success, more people showed up than anybody expected, but it all went smoothly. I'm smiling, but exhausted, and we're not even done yet. 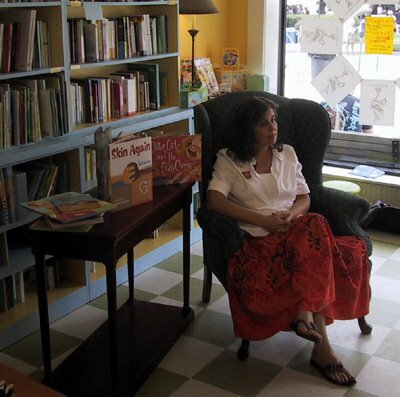 In fact, I need to go grab a shower (it's Sunday morning) so I can see Carmen Deedy at 12:00 and give a drawing demonstration at Little Shop of Stories at 1:30. To be continued! . . . Tired! Oh so tired, must . . . be . . . lively! Carmen Deedy opened this morning with a wonderful story about a beautiful cockroach. She really is a master storyteller, completely engaging and so animated. Everybody adored her. Stan and I walked around a bit before my next gig. It was a little overcast, and while still crowded, it was a little quieter than Saturday. Very nice actually. 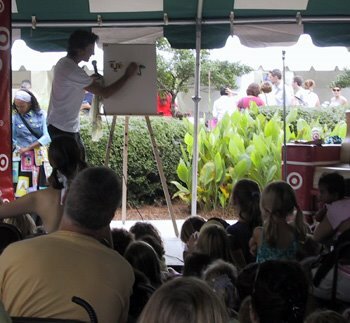 At 1:30 I headed to the Little Shop of Stories activity tent to do a drawing demonstration. 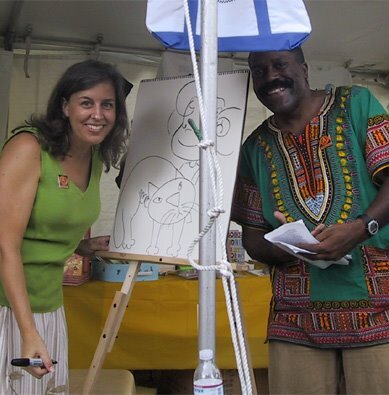 Here I am with another talented storyteller, Rob Cleveland. He is also director of development of August House, a publisher dedicated to folklore and storytelling. Since he MC'd many of the panels, I got to talk to him quite a bit, what a nice and dynamic person. Shortly after this picture was taken, the skies opened up and dumped a river on us. I heard someone comment, "I'll bet they're complaining over at the adult author venues." 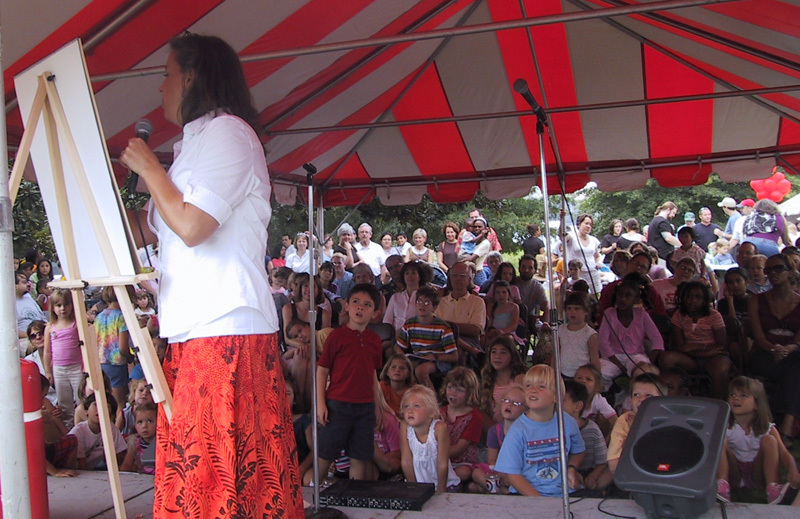 At the children's stage, everybody was soaked, smiling and jumping in puddles. Mary Ann Rodman and Hester Bass were quite brave as they continued their presentation through the very loud storm. Nobody wanted to leave! Hester read her new book, "So Many Houses," and Mary Ann read her latest, "First Grade Stinks." Mary Ann won the Charlotte Zolotow award (best picture book text) for her book, "My Best Friend." They did move into Little Shop of Stories to do their signing. The store was packed and everybody was soaked, but still having a good time. Parents were reading to their kids all over the store. Art Roche did a cartooning demonstration in the front room - standing room only! Meanwhile, I mingled with friends Elizabeth Lenhard (and family), author of the "Chicks with Sticks" series, and Alan Gratz (and family), author of "Samurai Shortstop," and new friends, Lauren Myracle, author of the "ttyl" books, and Vicky A. Schecter, author of "Alexander the Great." 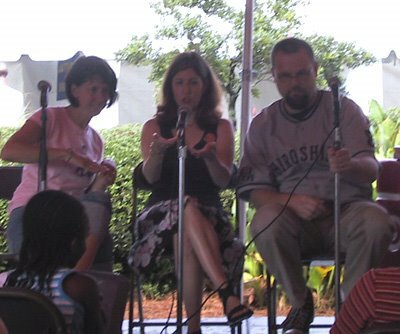 The rain finally stopped and Lauren, Elizabeth and Alan continued their YA panel on the children's stage once again. Update: Elizabeth wrote a nice bit on the festival and included a great pic of the four of us and her baby "La la" hanging out before their gig on her BLOG. It was very interesting hearing their different approaches to writing and writing styles, as well as how they often pull the familiar into their stories. And that was the wind-up for the day. We headed home to relax a bit before going out for a quiet and celebratory dinner, then found ourselves at Cafe Lily just in time to enjoy the fireworks over downtown Decatur (they had chairs set up out front). What a show. What a great capper to an incredible weekend. The organizers did an amazing job. Most I mentioned above, but I have to give a special call out to the people at Little Shop of Stories. I don't think anybody expected the crowds that showed up, especially for the children's events, but there wasn't a single hiccup. Diane Capriola, Dave Shallengberger, Terra McVoy, and thir cast of supporters pulled off an event that can only be described as MAGIC. Wow E! What an amazing pivotal day! Bask in the sunshine sweetie. Had an wonderful time - Glitter Girl and the Crazy Cheese is a big win for my daughter - we love to laugh! Way Cool, E. Next time this comes around please let me know so I can bring a raft of students to witness the shanannigans! BTW, did you know that Bill Mayer and I worked together at Whole Hog Studios way back in the 70's? He's still a very good friend, and one of the best illustrators on the planet. School Visits with Dumb Bunny! "Queen Bea" receives honorable mention! All Artwork © Elizabeth O. Dulemba, - Y'all play nice, okay?